According to a new unconfirmed report, Microsoft is planning to drop their Xbox Live Microsoft Points scheme and replace it with a system that uses actual cash values for digital purchases. Citing “sources familiar with Microsoft’s Xbox plans,” The Verge is reporting that the decision to end the Microsoft Points program was made in order to put Xbox Live more in line with Windows 8’s cash system. The unconfirmed Microsoft “gift cards” will be sold in a similar manor to Apple’s iTunes cards, and will allow Xbox Live users to use actual currency amounts for their digital distribution purchases. 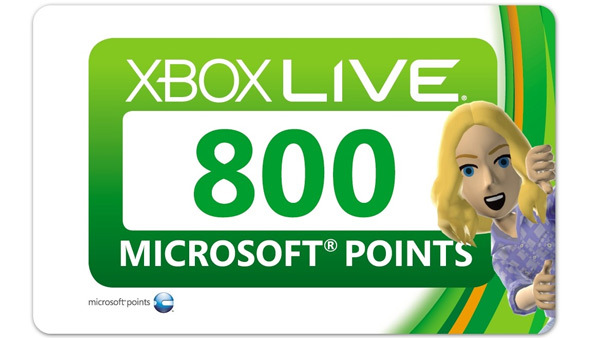 With the Microsoft Points system users would often end up with worthless amounts of leftover MS Points, as the conversion rate equaled $5 for 400 Microsoft Space Bucks. Assuming the report is correct, the new gift cards will be available to buy in retail stores, where they can be added to Xbox Live accounts, or users can simply use credit and debit cards to make digital purchases. Once the new system is up and running it will also unify Microsoft’s various digital marketplaces (the Windows Store, Windows Phone Store, and Xbox Live). The sources claim that Microsoft will announce the joyful end to the Microsoft Points system “as soon as E3,” and will roll out the gift cards before the next generation Xbox (Durango/Xbox Infinity) launches later this year. Now, before you get all excited about this news, keep in mind that this is not the first time that we have heard the death bell toll for Microsoft Points. In October of last year there was talk about the system getting phased out, however, that was quickly shot down by Microsoft a few days later. With that in mind, it is best not to count your Microsoft gift cards before they hatch. We will keep an eye out for any confirmation on the death of the Microsoft Points system, and let you know as soon as anything is made official.